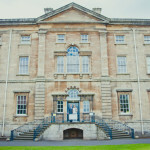 Come and view the venue dressed for a wedding and meet some of our local suppliers. Celebrate The Bridal Emporiums 2nd Birthday at Bar Soba - A night full of beautiful wedding inspiration. Doors open at 7pm up stairs at Bar Soba, there will be an opportunity to chat to many local wedding suppliers - a very special selection of the best from the industry. From florists to cakes, photographers to wedding stylists and many more will be on hand in our wedding fair area all through the evening. 8pm is the start of a fashionable, bohemian, chic, vintage inspired catwalk. We have some brand new designers coming to the store and we're showing them off on the catwalk on real woman. Alongside the new designers there will be several independent British designers showcasing their wedding dresses, bridesmaids dresses and evening wear on the catwalk. The Bridal Emporium is bringing you up close and personal to the many options of wedding dress shopping! Who knows you may fall in love with one of the top end designers, local independent designers dresses or even consider getting your wedding dress specialy designed and handmade in store. 9pm we have some funky live music from our resident DJ. Chance to chat to all the wedding suppliers/designers and drink some more bubbly. 10pm Upstairs closes down but carry the night on downstairs at Bar Soba. Tickets include 1 complementary drink per person on arrival, a goody bag and canapes will be available all evening in the venue. This is a not for profit event, all profit goes towards Alzheimers Research. There will also be a chance to enter prize draws on the evening, your chance to win amazing gifts towards your wedding. 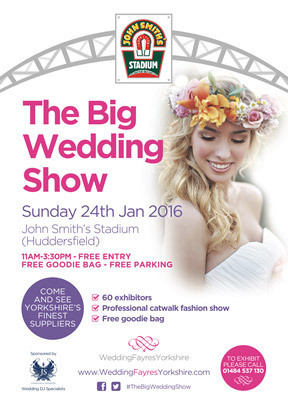 Visit Huddersfield’s biggest wedding show on the 24th January between 11am and 3pm and meet the local wedding suppliers. The fair will feature stands from 60 finest wedding suppliers from across Yorkshire as well as live entertainers and a compere.